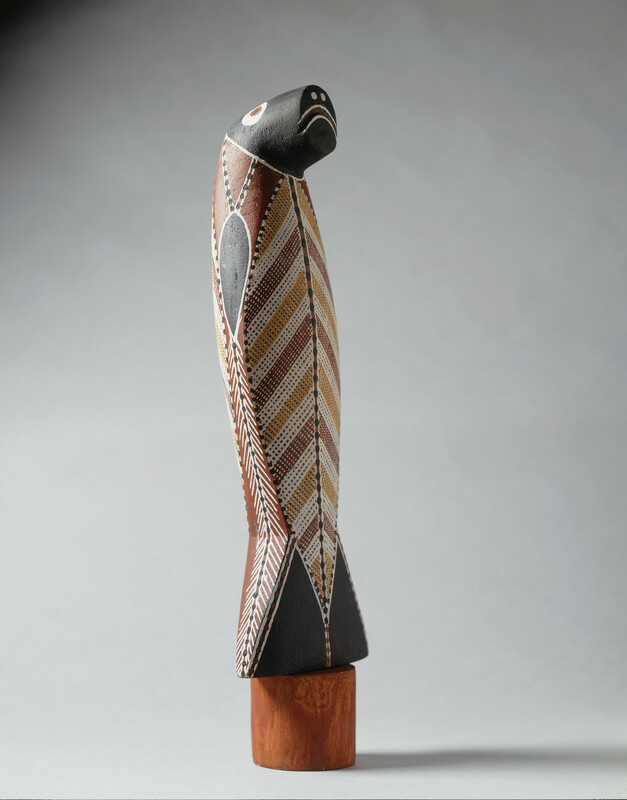 A stylised Aboriginal carving of a dugong mounted on a wooden circular base, made by Stephen Kawurlkku, a Ndjebbana man from Maningrada, on the coast of northern Australia. Dugongs have traditionally held great social and cultural importance in this area and among Torres Strait Islander communities. In certain instances they can be legally hunted as a protein-rich food and for ceremonial and medicinal use. In some Aboriginal communities, distribution of dugong meat is important in the fulfilment of kinship obligations. Dugongs also feature heavily in traditional creation stories, myths and rituals. This carving is painted in with red, brown and yellow hatching on a black ground, a style of decoration associated with the coastal indigenous groups of Australia. Dugong are marine herbivorous mammals.